Horses have been a source of enjoyment for hundreds of years as well as a source of labor and travel for centuries. These beautiful animals are both powerful and graceful and deserve the best care we can provide. In today's modern world horses spend a tremendous amount of time on hard surfaces. Most horses are sensitive to hard surfaces, and yet many people, particularly in the western United States, have few alternatives to working horses on dry, hard ground. Many of today's horses are raised in small pastures and exercised in circles on the lunge line. These horses are finer boned with flatter feet. Many have thinner soles and hoof walls. We keep them in bandages and work them in boots. Without leg gear, they look almost naked and vulnerable. These are all results of the changes that have occurred over time both in our environment as well as the technological advances in our infrastructure and the available space for our equine activities. Designing and maintaining arena surfacing entails advanced technology. There are a great deal of options available to improve the surfacing material but different surfacing materials may have differing effects dependent upon the specific animal. What we know for certain is hard surfaces provide unique potential problems to the health and well being of your animals and care should be taken to minimize the risks and the potential hazards. Understanding how animals interact with the ground and how that interaction impacts their health and well being is part of the study of the biomechanics of concussion. Researchers around the world affiliated with veterinary schools of medicine as well as engineers and practicing veterinarians are working together to study the biomechanics of horses. These researchers are building a foundation of knowledge around the impact with the ground and the resulting wave of shock that travels up the horses leg until it pushes off to facilitate propulsion of the next limb in the gait sequence. What the research indicates is that not all horses hooves impact the ground the same way. Differences in when and how the hooves impact and transfer from front to back or back to front affect the shock wave the animal experiences from the contact. Horses with hooves that land heel-first may jar the wings of their coffin bones every time a hoof hits. A horse's hoof hits with the caudal heel zone first, then transfers the load to the front portion. Some horses may land flat, or even toe first. Biomechanics experts believe heel-first landings to be the most efficient functional loading of the foot since the foot has a two-phase landing to deal with shock. Hilary Clayton, BVMS, PhD, has written that the heels might actually act as a natural shock absorber for the horses foot by landing first and deforming at higher speeds. She has also found that the entire hoof wall deforms more at high speed gaits than when at a walk and that the horn tubules, which transmit shock up the hoof wall seem more adept at shock absorption than the laminar system within the hoof wall which transmits the shock from the hoof to the bony column of the leg beginning with the coffin bone. It's best for horses when the surface will allow the toe to dig into the ground and hold firmly which gives the horse something to push off against. Rock hard, slippery surfaces that give no dig or those that are too soft and collapses behind the horses foot are the worst surfaces for horses to work on. Most surfaces fall somewhere in between the extremes and different surfaces are suited for different types of activities. The market has developed numerous products designed to absorb shock and reduce stress on a horses feet. While these products may be used to improve horse health, several factors impact their effectiveness. For example, the surface the horse is working on as well as the overall condition of the horse impact the effectiveness of horse protection products. How the horse is shod, how long since it was shod and the animals threshold for pain also play a role in the effectiveness of protection products. Pads and shoes are the most commonly thought of protection. Pads are most often made from plastic or leather and are available in different thickness and angulations. A variety of styles available includes frog pads, heel pads and pads with rim patterns which are open in the middle over the frog so the foot can be easily cleaned. Full pads cover the entire foot. A full pad will cover the sole and you won't be able to see any bruising. A leather pad forms to the foot; a plastic pad retains its flat shape to a great degree. Leather pads absorb moisture and seem to support the foot; plastic pads depend more on packing to fill the cavity. Farriers tend to prefer one type or the other; don't try to talk your farrier into something new, since he or she might not have the right cutter on hand, or any special pads. Many farriers will use a "medicated" substance like Hawthorne's Sole-Pack. Hard surfaces have been found to increase the likelihood of bone and joint-related injury in horses in the limb due to high frequency vibrations and concussive forces from primary impact. Foot soreness and front foot soreness are recognized injuries across all spectrum's of horse activity but is particularly problematic in jumping due to large deceleration peaks and high loading rates. Dressage horses are also found to suffer foot soreness. The Equine Surfaces White Paper has been drafted to provide a research level perspective on the factors influencing the performance and soundness in equine animals whether they are used for sport, leisure or work. This report looks at a broad variety of influencing factors and provides interesting insight into equine management from all perspectives. One area facility managers and private ranchers can add protection for their animals is in their choice of surfacing for pathways in and around the barn. There is a constant need to balance maintenance, budgets and comfort of the animals (as well as the users!). Concrete surfaces provide an easy to clean option that requires little maintenance but is a very hard surface that doesn't provide good traction for the animals. 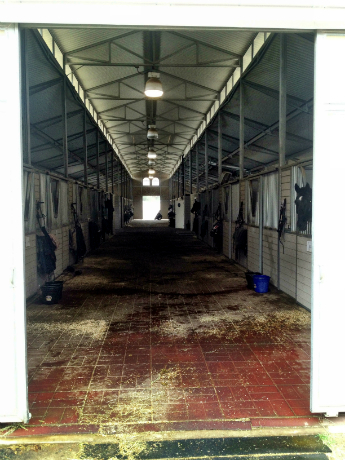 Dirt is commonly used in breezeways and stalls but is more difficult to keep clean and may become muddy and unstable in wet conditions. surface that provides added comfort while also improving traction over hard surfaces like concrete without diminishing the ability to maintain a clean and sanitary environment. Horse matting can also be used in bedding areas to reduce stress on the feet and legs and can even be used to provide padding on paddock walls to provide added protection in the event the horse kicks out into the wall. Rubber stall mats can also be used in washrooms to provide a non-slip surface in wet areas that need stability and drainage as part of their design. Rubber flooring makes an excellent surface material and is widely used in this type of application. It provides the durability needed for long lasting performance while providing the necessary benefits for use in this type of application. There are many types of horse mats available in the market. Different color options as well as different styles allow for their use whether the facility is being newly designed or is already in use. Dog bone style rubber bricks may be used to achieve a traditional brick paver look or larger rubber tiles can be used to retrofit existing space providing a thinner overlay that gives either a brick top pattern or a flat pattern look. Larger 4' x 6' black rubber pads may also be used to provide a basic black cushioned surfacing that is covers a lot of area in a single pad but carriers the downside of heavy weight that is harder to handle. All of these options will provide the cushioned surface to provide relief to your animals while also creating a slip resistant surface whether wet or dry. Whatever you may decide, there is a product available to meet your needs and stay within your budget while providing the added protection of a rubber horse stall mat for your barn, ranch or backyard sanctuary for your animals.